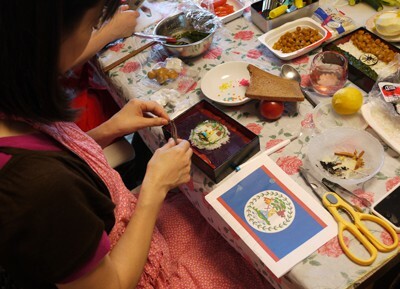 We roughly decided following rules to make National Flag Bentos(Kokki Bento＝国旗弁当). ■ Express respect to each nation, the flag bento use for the dish and foods connected with the country if possible. ■ Neither a colorant nor the thing which cannot be eaten uses, but expresses a color using the food in markets. Actually, some bento are not suitable for lunch with a lot of jelly for example… But I would like to improve those more, because national flags are very important for each country. The difficult things to make those national flag was looking for blue foods (blue food hardly exists in a nature), and reproduction of fine pattern and emblems in flags. Then, I talked to my friends about this project to help: They are a professional designer, an imported foods store manager, a restaurant chef or a nuturitionist. Moreover, We learned wonderful works and technic of the “Kyaraben” of Japan. They were very helpful for us. 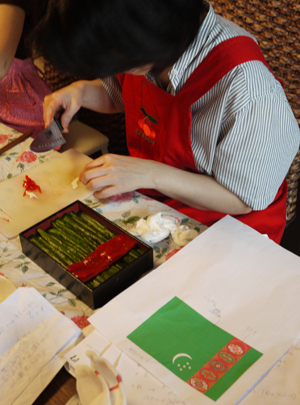 The process of making of flag bentos was sometimes pleasant and sometimes hard for us, still we are so happy to share the joy with people of all the world through them!